Price from: $360 - Book now! Welcome to Siem Reap, the provincial capital and gateway to the ancient Angkor temples. Recognized as a World Heritage Site by UNESCO, the Angkor Archaeological Park encompasses dozens of temple ruins including Bayon, Banteay Srei and the legendary Angkor Wat. Upon arrival, you will be greeted by our local guide and taken to the hotel to check in. Time for refreshment. Walking orientation around the hotel area followed by the Phare show at Cambodia Circus Centre to expect the unexpected. More than just a show, Phare performers use theater, music, dance and modern circus arts to tell uniquely Cambodian stories; historical, folk and modern. The young circus artists will astonish you with their energy, emotion, enthusiasm and talent. For your most convenience, A table with hot tea or coffee and breakfast box is arranged by Travel Cambodia will be served right on site in front of Angkor Wat. Your journey continues with a visit of the South Gate of Angkor Thom, which is famous for its majestic doors and artifacts. From here, ride on an elephant to monumental temple of Bayon which is the heart of Angkor Thom. Later, visit the Elephant Terrace, Terrace of the Leper King and Takeo "Jewel of Crystal", which is dedicated to the Hindu God Shiva and was erected at the end of the 10th century. You should not miss Ta Prohm Temple, which is a wonderful combination of human genius and natural beauty with its giant trees that have grown there for centuries. After breakfast, check out of hotel and transfer then to Tonle Sap. This is the largest permanent fresh-water lake in South Asia and flows into Tonle Sap River, joining the Mekong in Phnom Penh. We will see a “floating village” – boats have been converted to look like houses and the “village” move from place to place following water levels. In the afternoon, take a 5 hour drive from Siem Reap to Phnom Penh- the recent Capital of the kingdom. The journey offers an excellent opportunity to observe rural Cambodia up-close. Stop along the way and visit a market, where every assortment of street food is available, including the Khmer favorite: fried spiders! Of course feel free to try one. Once you arrive in Phnom Penh, check in hotel and free at your leisure. Phnom Penh was founded in the 14th century and has long been a vital trading hub at the confluence of three rivers: the Mekong, Tonle Sap, and Bassac. Start the day learning about the Khmer Rouge and Cambodia’s recent history on a guided tour of the Tuol Sleng Genocide Museum and the notorious Choeung Ek “Killing Fields.” Our cultural tour continues as we visit the National Museum—a journey into ancient Khmer art and civilization and the Royal Palace, home to the royal family and the opulent silver pagoda. Enjoy some free time to rest and freshen up before driving to the dock to catch an evening boat cruise along the Mekong River. Savor a welcome dinner on board as you watch the sunset over the shimmering lights of Phnom Penh. After breakfast you are free at your leisure until our driver takes you to Phnom Penh International airport for departure flight home. My husband and I are visiting in July. 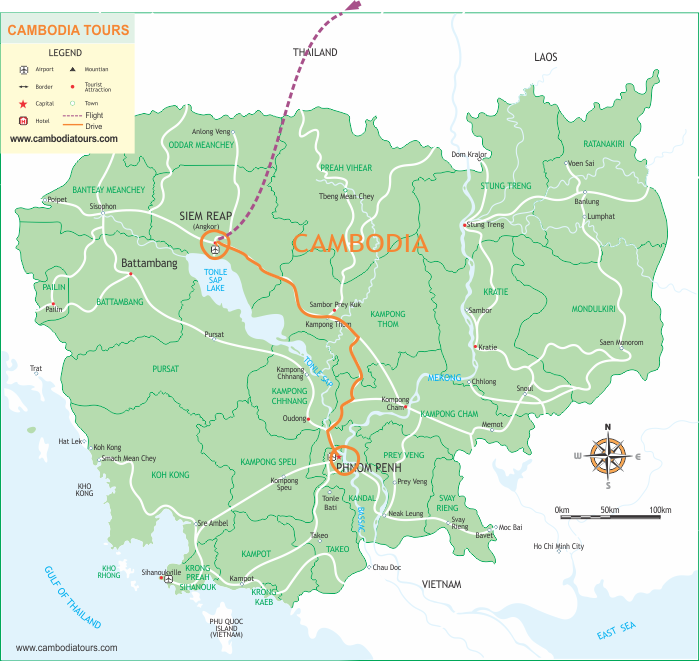 We would like to tour Siem Reap to the sights of Phnom Penh with possible cruise between the two. We sent you details via your email. Please check it. Please feel free to contact us should you need any further assistance. we are planning to get do a tour of siem reap and phnom penh. We well noted your message and one of our travel consultant sent you details via email. We only run private tours so the itineraries are very flexible to match your own flight schedule. You can depart on any dates at your favor. Please check you email and let us know your comments.